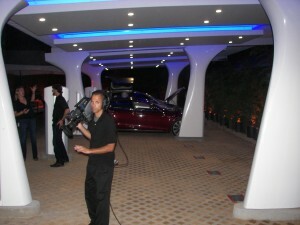 Tesla Charging Station – Free! 1. 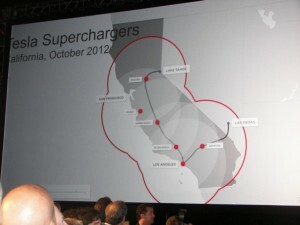 Supercharging hardware is standard on Model S vehicles equipped with an 85 kWh battery and optional on Model S vehicles equipped with a 60 kWh battery. With the most energy-dense battery pack in the industry and best-in-class aerodynamics, Model S has the longest range of any production electric car in the world. Model S comes with three battery options to fit the unique needs of different drivers. The 85 kWh Model S has received a U.S. fuel economy rating of 89MPGe and an EPA rated range of 265 miles. Model S is the first premium sedan designed from the ground up to take full advantage of electric vehicle architecture. A revolutionary powertrain sits under the floorboard of Model S, creating an ultra-low center of gravity. Paired with an aluminum body engineered for superior handling, Tesla has created a vehicle that raises the bar for performance and efficiency while meeting the highest standards for safety. Without an internal combustion engine or transmission tunnel, the interior of Model S has more cargo space than any other sedan in its class and includes a second trunk under the hood. Model S seats five adults and two children in optional rear-facing child seats. Model S Performance models accelerate from 0 to 60 mph in under 4.4 seconds. The interior features a 17” in-dash touchscreen with internet capabilities, allowing for streaming radio, web browsing and navigation. Customers can reserve a Model S at one of Tesla’s retail stores or online. Next Topic: Alternate Car Expo 2012 – Free Electric Car and Alternative Fuel Test Drives!